My dream had come true and I was back in India after 22 years. I was also in the middle of a divorce that seemed to threaten my very sanity. My initial purpose in taking this trip was to do a cultural anthropological study of India from 22 years ago to generate written work to help me begin a career as a cultural anthropologist and assist with the college students traveling with my former professor. 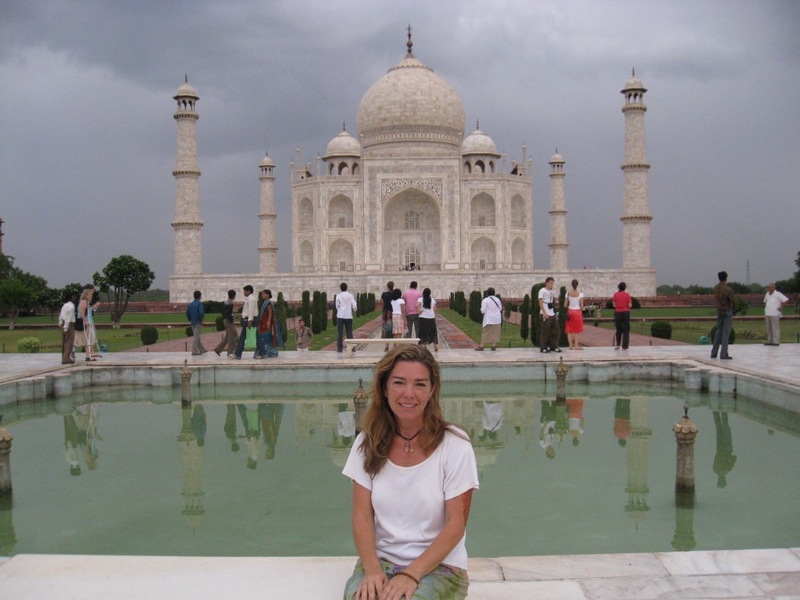 Another part of me knew I was in India to rediscover myself and heal from all that I had endured the previous year. My life had completely disassembled itself before my eyes and I felt ungrounded and lost in my new life alone after 17 years of being a wife and mother. At first India welcomed me and I felt her familiarity like a long awaited homecoming. Then I quickly went into cultural immersion and full confrontation with myself as India overtook me and pulled me in. The summer heat in Delhi was overwhelming as the monsoons had not come that year to give the usual break to the heat wave. Temperatures in the upper 90’s and nearly 100% humidity made walking about a struggle as I clutched a bandana in my hand to mop the sweat dripping into my eyes and felt my clothes plaster to my small body. As a woman who hardly even sweats during a hard workout at the gym, this was beyond anything I had ever experienced. I told myself I was having the ultimate ‘spa detox’ experience to give it a positive spin. One particular day, while out with some students in the group, my stress increased to where I felt completely out of my body. Men physically running over and into me, people staring at me intrusively while getting in my ‘American personal space’, sidestepping cow dung, navigating groping beggars, and numerous vehicles nearly smashing my toes had me wondering why I had come and what had I hoped to gain from being here. While I never felt threatened in India, in fact I felt physically safer here than in New York, my presence as a woman here took me to places of vulnerability. I knew I would have to acclimate and find my groove…adjust to the culture and pace, and my place in it as I had before. After all I was not here to be a tourist and cling to my comfortable American ways, I was here to immerse myself in culture, let it transform me and teach me about myself. My inner prayer was for healing and transformation, to be able to detach from the pending divorce and be with myself in this magical, soul-stretching place. I had made a personal commitment to have as little contact with home as possible, even though I had a cell phone in case there was an emergency with my daughters during these 5 weeks. In those initial days, jet lagged, hot, and overwhelmed with my displacement, I was deeply tempted to text and call home to friends to anchor myself and elude this Indian reality. Instead, I held firm and did not run from myself and my emotions. The only way out of my discomfort was to live through it. In Agra, 6 days into the trip, I found solace on a rooftop at sunset. With the Taj Mahal clearly visible, the red streaked sky all around, and the call to prayer echoing out over the city, I prayed and went deep within. Tears came to my eyes, goosebumps raised on my skin, as I asked for help and guidance. Feeling one with the Indian people while having my own spiritual practice as they were simultaneously having theirs brought me into deeper resonance and feeling at home. The quiet of this time and place soothed me deeply. With each breath, I went deeper within. The call I heard was to rely on Spirit inside of me rather than outer securities. In Spirit I would find comfort, grace, support and inspiration for the days and years ahead. Everything else could and would eventually pass away. The only real reliance I could have in this life was inside of me with Spirit. More tears came, as they always do when I hear a deep truth within. This knowing felt solid and more real than anything else. I left the rooftop that night feeling loved and held firmly by a force greater than myself, more clear about what I was looking to find inside of me, and faith that I would get all that I came for and more. I was back in love with India.